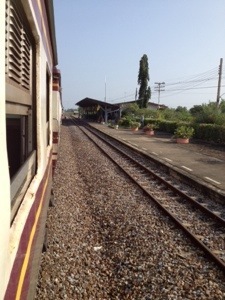 Starting the day at 4.45am me and Katie jumped in a taxi to take us to Bangkok train station. 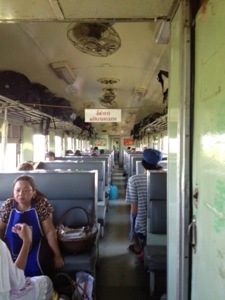 We purchased our 50bht (£1 approx) tickets for the 3rd class train to take us to Aranyaprathet, the border of Thailand. The journey was supposedly 6 hours but it took 7. The train was clean and all the windows wound down so there was a nice breeze with nice views, just very uncomfortable after sitting on a train seat for 7 hours. 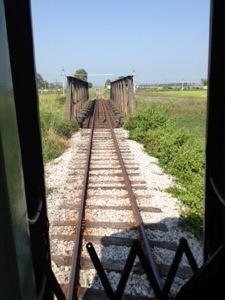 Once off the train it was then an 80bht tuk tuk drive to the border. Once at the border we had to go through Passport Control and then it was a 10 minute walk to get our Visas. This cost $20 as expected but then there was a surprise 100bht to be paid, for what? No one that day was actually able to find out! Once the Visa was stapled into the passport it was then a further 5 minute walk to another Passport Control where yet another form was to be completed and finger prints and photo taken. This border crossing on foot took approximately an hour. 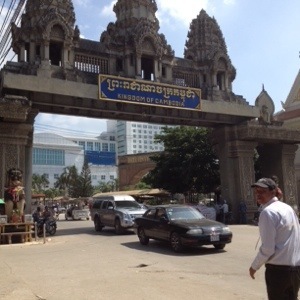 Finally we were through to Cambodia, but it didnt stop there; it was then an official free bus ride to the bus station. For $10 we bought our bus ticket to Siem Reap and 3 hours later we arrived, but only in the town, it was then another tuk tuk journey to our pre-booked hostel, Mad Monkey. Time of arrival 6.15pm!! The journey ran smoothly thanks to some internet research we did, it was just made tough due to the uncomfortable transport, heat and heavy backpacks. It’s times like this that make travelling alone rewarding. I treasure and appreciate experiences, whether good or bad and am able to deal with the bad. Travelling alone means you do not have your treasured experiences ruined by someone elses grumbling.